As a florist what will make your work stand out? What can you offer with your flowers that a local superstore couldn’t offer with theirs? Certainly in this day and age it is difficult for a high street florist to compete price-wise with your major grocery store which can offer bouquets of flowers for under £10. So as a florist you need a USP – a unique selling point. This is something that will encourage people to come back to you time and time again and that only you can offer. It will become your trade mark and show people that you care because you go the extra mile to ensure that your designs are different. Generally it is how you put the finishing touches to your arrangement that sets you apart from other florists. But it is often very difficult to know what makes the right finishing touch. A lot of florists offer a unique gift wrapping service using a variety of materials. They generally stick to colour themes when it comes to wrapping and that colour then becomes synonymous with that florist. It could be a particular type of paper coloured cellophane or trimmings but they will all be along the same theme or at least complement each other. Gift wrapping comes in different forms. 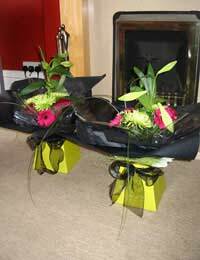 You could finish off your bouquets by placing them in coloured boxes which complement your flowers; cellophane boxes and cylinders could all be given the “wow” factor with imagination and give your design a unique finishing touch. Certainly the use of bows and ribbons can enhance an arrangement and give it instant impact and style. Wouldn’t you rather see something beautifully wrapped and trimmed rather than in a plain boring paper? The arrangement inside may be fantastic but you won’t notice its beauty if it doesn’t have that finishing touch. Decorative wire and beads are a wonderful way to finish off wedding flowers. And depending on the theme of the wedding, it is perfect for everything from a corsage to head-dress, hand-bag spray to bouquet. You can get wire and beads in virtually every colour from a good craft shop or floral wholesalers. It’s up to you and your customer on how you would use them but virtually anything goes. Imagine beaded wire wrapped round a bouquet handle and jewelled beads glued onto rose petals or head-dresses. The effect would be stunning and make your designs special. Feathers add movement and colour to any arrangement. They are perfect in bouquets or floral displays and can tip a design over the edge from being just good to exceptional.Butterflies and other creature adornments are popular for themed events. Just an odd one here and there on a display can make it really quirky and unusual and again a perfect finishing touch. Never underestimate the good old vase, basket or pot. Glass vases can add style and elegance to any arrangements, while a gloriously rich coloured terracotta pot adds vibrancy and depth. Baskets can be perfect for a lovely country display of simple flowers. At the end of the day, anything that can give what you do the edge, is the perfect finishing touch. At the time it will make people smile and draw the eye to the arrangement, and that special something will remain in the recipient’s mind long after the flowers have died.